We're just a few turns away from the E18/E20 motorways, and you can park your car right outside our door. We have many flexible meeting rooms as well as our Köksbaren restaurant, where you can run through your day over a bite to eat. Take a swim in our pool and pour a ladle of water on the sauna rocks. After exploring the sights of Orebro you can visit our relaxation suite and relax in our sauna, or take a dip in our pool. End your day with a meal in our Köksbaren restaurant and enjoy a drink in our relaxing bar. Hold your meeting or conference in one of our 12 conference rooms with capacity for up to 180 people. As a hotel guest or conference participant, you always have free WiFi. Our hotel is located just outside central Orebro, making it a great base from which to explore Orebro's choice of entertainment. Close by our hotel you'll find Northern Europe's largest indoor playland, Lek & Busland, and Gustavsvik leisure centre with its Lost City water park is located about 4 km from our hotel. If you feel like a round of golf, LannaLodge, Orebro City and Orebro Golf & Country Club are no more than 5–15 minutes away by car. Orebro city offers a good selection of cafés, restaurants and shops. 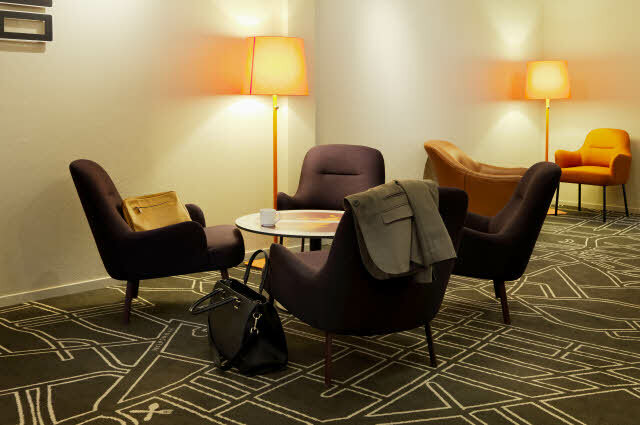 We have 9 modern, flexible and spacious meeting facilities for up to 180 people, 7 smaller meeting rooms and 208 bright, functional hotel rooms decorated in a Scandinavian style.